Title: 03/24/1995 - Compliance with the Occupational Safety and Health Administration's (OSHA) Hazard Communication Standard (HCS) and the requirement for Material Safety Data Sheets (MSDS). Thank you for your letter of February 5, to Mr. Joseph A. Dear, Assistant Secretary of Labor, concerning compliance with the Occupational Safety and Health Administration's (OSHA) Hazard Communication Standard (HCS) and the requirement for Material Safety Data Sheets (MSDS). In your letter you wished to know if the following statement from an advertisement cover-sheet is correct: "The federal OSHA and all state OSHA's have ruled that this system meets the requirement of having current copies on file of all MSDS." The ad that you provided is misleading. First, Federal OSHA does not review specific products and, therefore, has not reviewed or approved the system you refer to. Second, the $7000 penalty figure quoted in the ad is the maximum amount that OSHA can cite for a serious violation. It is not the typical amount cited for failure to have or to provide employee access to an MSDS. Review of OSHA's FY 1994 inspection data for HCS indicates that the average penalty amount was less than $500, and in many cases there was no penalty assessed. "The employer shall maintain in the workplace copies of the required material safety data sheets for each hazardous chemical, and shall ensure that they are readily accessible during each work shift to employees when they are in their work area(s). (Electronic access, microfiche, and other alternatives to maintaining paper copies of the material safety data sheets are permitted as long as no barriers to immediate employee access in each workplace are created by such options.)" Again, as a policy matter, OSHA does not approve materials developed by the private sector. If any organization represents OSHA's review as an approval and advertises the material as being OSHA-approved, OSHA will refer the matter to the Federal Trade Commission for action. You are free to forward a copy of this response to any and all parties interested. In spite of any claims by advertising, compliance with OSHA standards is determined by OSHA compliance officers during an on-site evaluation. When a compliance officer inspects a facility, the adequacy and accuracy of the hazard communication program is assessed, including MSDS, labels, and other written materials. We hope this response meets your needs and we appreciate the opportunity to be of service to you. 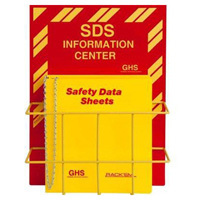 It is very important that an issue regarding the legality and OSHA conformity (29 CFR 1910.1200(e), et al) of service firms offering offsite electronic Material Safety Data Sheet retrieval libraries be resolved. For your information I have attached a sanitized advertisement coversheet which endorses such services as sponsored by a national membership organization. Please note the underlined sentence in paragraph four of the advertisement that states that "the federal OSHA and all state OSHAs have ruled that this system meets the requirement of having current copies on file of all MSDS". As both myself and the St. Louis OSHA office interpret 1910.1200, MSDSs representing all hazardous substances used by the employer must be physically present on the property and directly accessible by all employees. 1910.1200(g)(8) pg 369 "The employer shall maintain copies of the required material safety data sheets for each hazardous chemical in the workplace, and shall ensure that they are readily accessible during each work shift to employees when they are in their work area(s)". Most employers comply by having MSDS stations strategically placed throughout the plant that allow employees direct access without making a formal MSDS review request. Also, most 29 CFR standards require that certain risk analysis, risk determination, PPE requirements, exposure levels, exposure dangers, etc., be made by the employer. This obviously cannot be accomplished without first consulting a MSDS. Obsolete MSDS must be also be retained by the employer. The list of chemicals must be reviewed and updated annually. There are a myriad of managerial responsibilities that all refer to information contained within the MSDS. If the "federal OSHA" has made such a ruling please advise. If not, it is equally if not significantly more important that we notify our membership to prevent serious OSHA compliance problems as well as possible inadvertent employee endangerment by misinformed management victimized by a creative marketeer. Please expedite processing of this request.